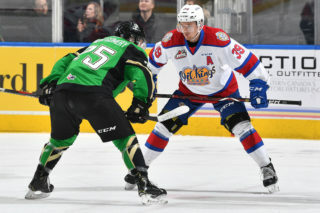 Vince Loschiavo scored twice in the span of just over three-and-a-half minutes to propel the Edmonton Oil Kings (42-18-4-4) to a 3-1 win over the Calgary Hitmen (36-26-5-1) in front of 12,180 fans at Scotiabank Saddledome in the final game of the WHL regular season for both Clubs on Sunday afternoon. 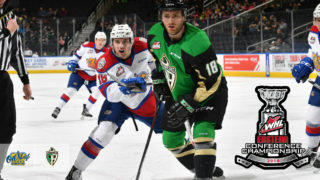 The Oil Kings venture into their first round playoff series versus the Medicine Hat Tigers on an 11-game win streak which ties a Club-best mark reached three times previously, most recently from January 17 – February 8 during the 2013-14 season. 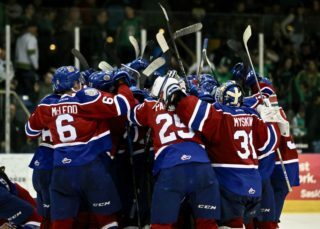 Todd Scott (11-3-2-0) earned the win in goal for the Oil Kings, turning aside 25 of 26 shots strewn his way. Carl Stankowski (10-11-2-0) took the loss, surrendering two goals on 35 Edmonton shots. For the second straight game it was the Hitmen who took a 1-0 lead, as Riley Fiddler-Schultz scored his fourth of the season at 10:07 of the first period. 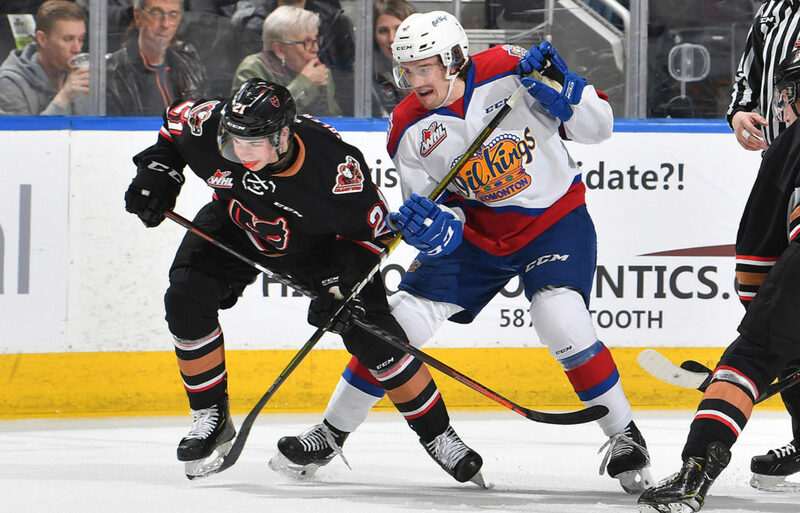 It was the lone goal of the opening frame, which saw the Oil Kings outshoot the Hitmen, 10-8. In the second period, Loschiavo’s first of the game came by way of the power play and tied the game, 1-1, at 7:14 assisted by Quinn Benjafield. 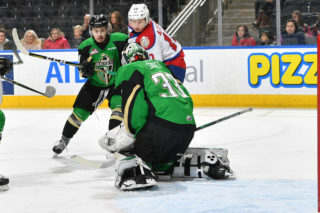 Just over ten seconds later Hitmen captain Mark Kastelic was given a double minor for high-sticking Wyatt McLeod, and the Oil Kings were back on the power play. Loschaivo would capitalize again, notching his 37th of the season from Trey Fix-Wolansky and Conner McDonald at 10:47 to take a 2-1 lead. 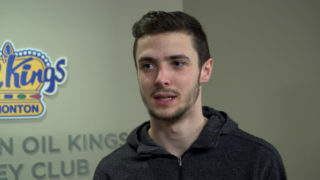 With 25 seconds left to play in the third period, Jake Neighbours iced the victory with an empty net goal, his 11th of the season from Scott Atkinson. Shots on goal in the middle frame favoured Edmonton by a large margin, 17-5, and 13-9 Calgary in the third for a game total of 36-26, Edmonton. 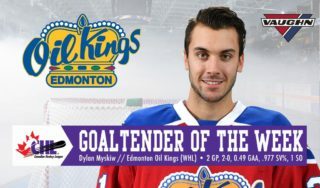 Loschiavo’s game winning goal increased his new record for game winners in a single season in Oil Kings modern franchise history to 11. Calgary was 0-for-4 on the power play, while Edmonton finished the game going 2-for-5 with the man advantage. Cael Zimmerman (CGY) (3), Carl Stankowski (CGY) (2), and Vince Loschiavo (EDM) (1) were selected as Three Stars of the Game. Edmonton will play host to the Medicine Hat Tigers in a best-of-seven quarter-final series which gets underway with Game 1 in Edmonton on Saturday, March 23 at 7:30 PM MT at Rogers Place. Single game tickets to Games 1 and 2 of the series will go on sale Tuesday morning, March 19 at 10:00 AM MT.